✔ This machine will strengthen and tone your legs and arms while also providing you with a great cardio workout. ✔ If you want to exercise your legs, just put our product on a flat and hard surface, sit down in a chair, and begin to petal. ✔ If you want to exercise your arms, put our product on your lap or a desk/table in front of you, place your hands onto the pedals, and off you go. 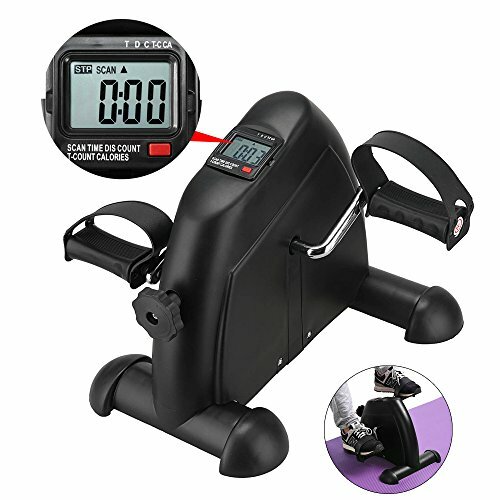 • Compact pedal exerciser can be used to strengthen both arms and legs, increasing circulation, improving stamina and relieving stress and tension for greater focus and concentration. • Quiet and smooth, the pedal exerciser to be used in the office as well as at home. Use while on your phone, watching tv, or playing video games to fit in beneficial exercise each day. • Compact design easily fitting under a desk or in a cubicle. Non-slip rubber feet ensure the pedal exerciser stays in place on any surface, including any tabletop, carpet or hard floor surfaces. • The low profile design keeps the pedal exerciser from wobbling and sliding while in use. Each pedal also has a nonslip surface with adjustable toe loops for added comfort and safety.